What Do You Mean They Can’t Collect Your Credit Card Debt? Remember the recent foreclosure crisis when dubious mortgage practices— including widespread document execution fraud, misrepresenting fees, forgeries on signatures for your key mortgage documents, and making deceptive statements about efforts to correct paperwork—became the norm, not the exception, for many a major mortgage lender from the West Coast to the East Coast? The result prompted a multibillion-dollar settlement with big banks and months, if not years, of mortgage sorrows for many an American homeowner. Well it’s happening again. And this time with the nation’s credit card debt. According to a new report from The New York Times, The same problems that plagued the foreclosure process are now emerging in the debt collection practices of credit card companies. “As they work through a glut of bad loans, companies like American Express, Citigroup and Discover Financial are going to court to recoup their money. But many of the lawsuits rely on erroneous documents, incomplete records and generic testimony from witnesses, according to judges who oversee the cases,” said The Times. While some debtors are disputing the fact that they owe money to credit card companies at all, many more borrowers are simply behind on their payments and are fighting the credit card companies’ claims that their debts are higher than they actually are. 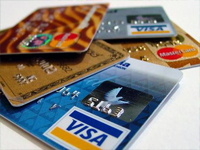 Fed up with the credit card debt conundrum? When you file for bankruptcy under Chapter 7 you not only eliminate your unsecured debt but also reduce the interest that you have to pay your creditors. For example, consider that most people who have credit card debt usually get in the habit of making partial payments—payments that, with high interest, end up being payments simply to cover that interest. Opting for bankruptcy instead means you will drastically erase the principal on unsecured debt, relieving you of all payments toward lingering personal loans and putting you on the road to a better financial future. Most importantly, by dumping debt through bankruptcy, you can also avoid the harassment of creditors and debt collectors. Bankruptcy’s automatic stay is a powerful court order that kicks in as soon as you file your precious bankruptcy papers. In addition to pausing any pending lawsuits, such as foreclosure proceedings, the automatic stay can put a stop to all forms of collection by creditors, including, repossessions, garnishment, harassing phone calls, and yes, even needless lawsuits. Ultimately, if creditors want to take action against you or your property, they have to get permission from the courts. If you too have been affected by lingering credit card debt and are wondering how to reduce what you borrowed to get back on track, knowing a qualified bankruptcy attorney can also help you to conquer your creditors and face your financial fears, yielding the right kinds of support, information and insights—at a low cost— for a viable and secure future beyond the current credit card landscape. The bankruptcy attorneys at the Law Offices of John T. Orcutt offer a totally FREE debt consultation and now, more than ever, it’s time to take them up on their offer. Just call toll free to 1-888-234-4181, or make your an appointment online at www.billsbills.com.